Temperature is an important factor in the composting process along with the CN ratio, moisture content, pH and aeration. The actual temperature will vary depending on the size of the compost bin, the air temperature, moisture content, ventilation, aeration of the material and the type of material being composted. The heat generated during the thermophilic stage of hot composting is the most important factor in the elimination of plant pathogen in the organic materials. However other factors such as competition for nutrients, the production of toxic compounds, the activity of enzymes produced in the compost and the production of antibiotics and parasitism within the heap also play a role. The effect of moisture content on the temperature is not always given sufficient recognition in home composting; it plays an important role in temperature distribution within the composting material. A higher moisture content will result in the hot core in the centre of the heap extending nearer to the surface, than is the case with low moisture levels, and higher temperatures near the surface of the composting material. This is important when taking temperature readings as it affects the depth to which the probe should be inserted. The temperature will also be influenced by the size of the materials being composted. Material that has been shredded, or does not exceed an inch and a half in length, will provide a larger surface area exposed to microbial activity and offer better insulation resulting in less heat loss and a better temperature distribution. The majority of the material on this page applies to hot composting where the composter is trying to achieve higher temperatures for rapid composting or to sanitise the product but there is some information towards the end on temperatures achieved when using cold or passive composting techniques. Environmental factors around the bin or heap will also influence the temperature and speed of the compositing process. Hotter temperatures in the summer and spring will increase the rate of decomposition while during the cold winter season the process may come to a virtual halt unless the bin is well insulated. It is hoped that more people (and schools) will be encouraged to monitor the temperature, pH and if possible the moisture content of their bins during composting and then send in details of their results for inclusion on these pages with details of the type of bin and material being composted. As an additional exercise schools could monitor the temperatures (and pH) of their Rotbots to see if they can record temperature rises during decomposition of waste in a litre container. Most of the temperature rise within the composting material is a result of the activity of the microbes in the bin. As the microorganisms work to decompose the compost, their metabolic activity generates heat, which raises the temperature of the composting material. 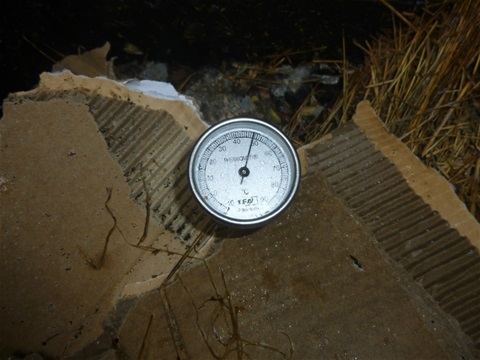 Temperatures between 32°C (90°F) and 60°C (140°F) normally indicate rapid decomposition is taking place in the compost heap and this is most common shortly after material has been added. Lower temperatures signal a slowing in the composting process. However, high temperatures, in excess of 60°C, result in a reduction in the activity of the majority of microorganisms. Thermophilic active at 45°C to 70°C. The psychrophiles a third group of microorganisms functioning at lower temperatures, in the range 10°C to 20°C (14°F to 68°F), do not play a significant role in hot composting but will be involved in keeping cold composting ticking over during in the winter in the UK and areas with a similar climate. During the hot thermophlic stage efforts should be made to ensure that the composting material is kept aerated and moist, additional moisture should be added in the form of water or compost comfrey tea. Providing air and moisture are at levels which ensure biological activity is necessary to hold the high temperatures required to destroy weed seeds, pathogenic microorganisms, the eggs of parasites and fruit flies, some of which, have been shown to survive in composting material at temperatures as high as 57°C for several days. If checked regularly the temperature of the decomposing material provides an indication as to when the pile should be turned to aerate to restore the microbial activity necessary to maintain the required temperature of for as long a period as possible. It has been found that during the thermophilic stage up to 87% of the organisms present in the sampled heaps were in the spore forming Bacillus species, with one species Bacillus stearothermophilus predominant at temperatures of over 65°C. However, there are a wide range of thermophilic bacteria and fungi that have been isolated from compost during the thermophilic stage. Although the heap will be repopulated when it cools it is desirable avoid temperatures of over 65°C to maintain a broad population of microbes to ensure decomposition of the composting material. The estimated optimum “hot” temperature varies in the published works between 45°-55°C and 55°-59°C while others favour 60°- 65°C. For the purposes of organic certification, the National Organic Program rule (United States Department of Agriculture [USDA], 2000) requires that compost produced through a process that combines plant and animal materials, using an in-vessel or static aerated pile system, must maintain the composting materials at a temperature between 131 °F (55°C) and 170 °F ( 76°C) for a minimum of three days. If using a windrow system these temperatures must be held for 15 days, during which time, the materials must be turned a minimum of five times. When hot composting at home the keen composter should maintain the temperature for 10 to 15 days. Larger and deeper heaps result in higher temperatures and better temperature distribution throughout the pile and therefore expose more material to the higher temperature required for speedy composting. As recommended elsewhere on this site three wooden compost bins of 1m x1m x 1m (approx 3ft x 3ft x 3ft) provide an adequate size to retain the heat produced by the microbial activity and make turning to aerate relatively easy as the material can be moved from bin to bin. However, at home, particularly with a single bin where the C:N ratio and the moisture contented may vary it may not be possible to maintain temperatures of over 50°C after the initial surge even with regular turning. The good news is that temperatures of 40°C if held still produce sanitised compost relatively rapidly. Alternatively, an insulated commercially available freestanding bin, such as the Hotbin, which operates at temperatures of 40-60°C, or tumbler bin can be used. While some people argue that if handled correctly the composting process can be achieved by turning the heap once, two or three times should be regarded as a minimum with the target being least five times during the initial two week period. An alternative method of maintaining higher temperatures is to base the frequency of turning the heap on the heap temperature. The temperature is recorded regularly and compost turned whenever the temperature falls below 55°C or rises above 72°C. During this stage of active decomposition by the thermophiles the temperature will fall a few degrees immediately after turning but will rise again reaching its original temperature within two or three hours. This means that if you are monitoring the temperature of the composting process it is useful to take additional readings during the three-hour period after turning. The recording and turning being continued until there is no marked change in temperature following the aeration. If temperature monitoring has been undertaken irregularly and the heap has been allowed to overheat to such an extent as to inhibit bacterial activity i.e. reaching temperatures of over 76°C. turning will be less effective in reducing the temperature. Watering the heap is sometimes suggested as a means of reducing the temperature but this should be attempted with care, as there is a danger of the heap becoming waterlogged. This temperature drop can occur in quite localised areas, which have become anaerobic, with the temperature falling to below that of the surrounding aerobic compost. I suspect that this might be the case with material being composted in sealed compostable cornstarch bags and would recommend opening (and emptying these bags, if they are used. The thermophilic stage is followed by a second mesophilic stage as the heap cools; during this, stage different microbes come to dominate the compost population. Some workers record a relatively quick fall in temperature to ambient temperature of stable and mature compost while others record a more gradual fall in temperature. The temperature will vary within different parts of the compost heap, which is why a number of temperature samples should be taken from different locations when recoding temperatures. The situation in cold composting is different as the temperature of a well-balanced bin in the UK rarely reaches temperatures where thermophiles play a major role. On average the temperature range for cold, add as you go, compost bin be dependent on the ambient air temperature. In some areas of the USA bin temperatures have been reported as being in the range 21 to 32° C (70 to 90 ° F), others report temperatures up to 49°C (120°F) in the initial few days. Lower, or maturing compost, layer was not significantly affected by the addition of fresh waste, to the bin unless the contents where turned and aerated. There are a number of ways of monitoring temperature of the compost heap or bin. One suggestion I have read is to “stick your fist into the pile” while another simple system involves pushing a garden fork or a metal pipe into the in the middle of the composting material during the first few weeks of composting and leaving it for a while. If when removed, it is so hot as to be uncomfortable to hold, the material is decomposing according to plan. This method was suggested to me as a suitable part of the training of gardeners and Master Composters. More accurate temperature recording is necessary to measure and demonstrate that the desired temperatures have been reached and maintained to kill pathogens and comply with any standards that are applicable. The progress of the composting process can also be monitored by means of temperature records. It is necessary to record the temperatures of the compost at several places in the bin or heap to give an accurate picture of what is happening. In the case of a compost bin where access is only available from the top a minimum of three sampling sites are suggested one near the back of the bin, one in the centre and one near the front. Sample should be taken from the same location in the bin every time the temperature is recorded. Soil and Compost thermometers are available from most Garden Centres although it may be necessary to order one on-line if operating a larger heap where a 24” to 36” probe would be necessary to reach the central core. (1/4 inch diameter probe is recommended). However these are considerable more expensive and if a shorter probe is all that can be afforded I would suggest drilling small holes in the sides of the compost bin through which the probe could be inserted to reach the compost in the central core. (Henchman sells a reasonable priced 20” probe). This approach has the additional advantage of ensuring that the temperature readings are taken from the same part of the bin on each occasion. It also allows temperature gradients to be measured at distances from the outside of the bin if the probe is inserted into the composting material 10cm at a time. Digital probes are also available but these tend to be more expensive but can have the advantage of providing a continuous reading. For hot composting, the temperature record should include the date the bin was initially loaded, even if it was not completely filled, and baseline measurements should be taken at three or more locations in the bin. The date and approximate weight of any addition material added. Temperature should be recorded daily if possible, or as a very minimum three times a week, and following turning to aerate the contents. This should demonstrate the dip in temperature following aeration and the return to operating temperature. In standard hot composting techniques (not tumbler bins) a hotter core may be found near the centre of the composting material, with cold composting the situation is different as the material in the bin tends not to be turned or if it is then the turning is less frequent and may not involve the lower levels of stable compost. In a conventional bin, the main microbial activity is in the upper layers and the temperature will decline with increasing depth. In the Imperial College, study as the waste became progressively more aged and stable the variation in temperatures at a 40 cm depth became relatively small.